For nearly three weeks, images of volcanic activity on Hawaii’s Big Island have been mostly focused on the East Rift Zone on Kilauea’s slopes, where fissure upon fissure has opened up in the earth, spewing forth red-orange lava and sending thousands of residents fleeing from their homes. On Tuesday, the volcano’s Halemaumau Crater snapped people’s attention back to the summit with a commanding display: An eruption produced a towering ash plume from the crater that reached 12,000 feet high at its peak and could be seen for miles. 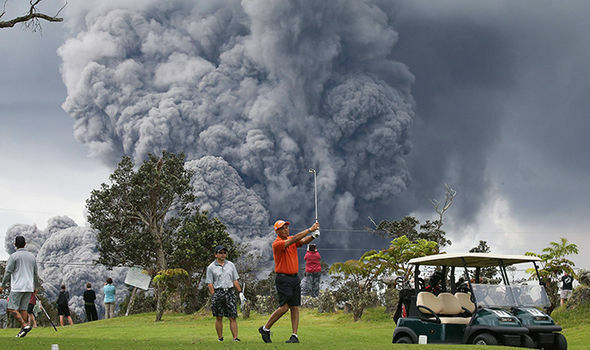 At the nearby Volcano Golf & Country Club, people scrambled up trees to take pictures and get a better view of the imposing dark plume that billowed over the greens. Others simply continued golfing as an apocalyptic cloud mushroomed behind them. But this wasn’t the explosion officials have been warning about. For at least a week, scientists have predicted that, if the lava lake at the top of Kilauea continues to drop and eventually meets groundwater, there would be enormous steam explosions that could send 10-ton molten rocks — or “boulders the size of cows” — as far as a half-mile from the crater. Those within 20 miles of the crater could also be subject to smaller falling rocks and ash. Such an explosion would be “the big one,” officials have said. Tuesday’s ash cloud, however impressive, was not it. Coombs added that geologists were not sure what had caused the intensified ash emissions Tuesday. The eruption prompted the Geological Survey to issue a new warning for aircraft, increasing its aviation warning from orange to red to signify “a major volcanic eruption is imminent, underway or suspected with hazardous activity both on the ground and in the air.” A temporary flight restriction for 12 nautical miles around Kilauea’s summit has been put in place. Ashfall and dangerous volcanic smog, otherwise known as “vog,” from the ash cloud were reported as far southwest as Pahala, a small community about 18 miles downwind of the crater. Unlike the sulfur dioxide gas that has been rising from the vents in the East Rift Zone, the ash itself from Tuesday’s cloud was not toxic, but was irritating, officials said. Damby told the newspaper officials were planning to provide face masks to the public that would protect against ash particles — but not against vog. Residents on parts of the Big Island have been scrambling to react to increased volcanic activity on Kilauea for nearly three weeks now, ever since the floor of the Puu Oo Crater, on the volcano’s East Rift Zone, collapsed on April 30. The break sent its pool of lava back underground. Days later, after several small earthquakes, the magma pushed its way back to the surface on the east side of the island’s Leilani Estates neighborhood, creating the first of many fissures to come. Hot steam — and noxious gases — rose from the vent, before magma broke through and splattered into the air. To date, at least 21 fissures have formed along a northeast-southwest line in the rift zone, most in the Leilani Estates neighborhood, which was evacuated more than two weeks ago. Lava emerging from the vents has destroyed dozens of homes. On Tuesday, officials said activity at Fissure 17, the biggest one so far, had slowed overnight. Its fountaining had diminished, and a lava flow from the vent that was heading east, toward a major highway, had slowed to a few than tens of yards every hour. Meanwhile, officials said they were paying close attention to the two newest fissures, 20 and 21, that had formed southwest of Fissure 17. “They’re very small still, but the potential for them to produce increased fountaining and lava flows is there, and we’ll be watching those closely throughout the day,” Coombs said Tuesday. To live on a volcano is to accept risk. On Hawaii’s Big Island, the risk has become reality.